We recently came across a great infographic from the folks over at GetApp, a site that helps businesses find the right learning management systems for their needs, that answers one of the big questions we get all the time from members and clients: What is the best LMS to use? We were lucky to get a Q&A with Suzie Blaszkiewicz, their market researcher and content editor, and she spoke with us about some of the thought process behind compiling this infographic. 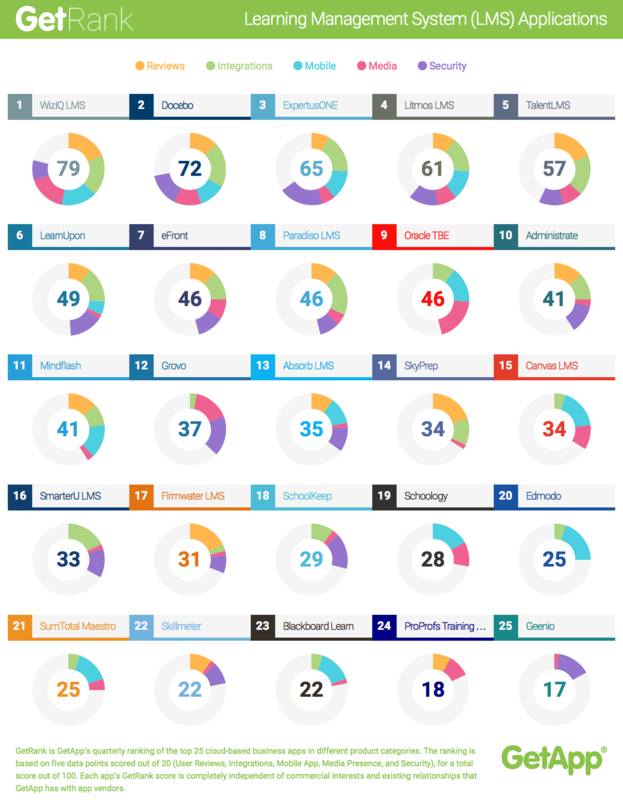 Your new report ranked the 25 Top LMS apps on the market today… What were the criteria you used to determine the list? We use a five-factor ranking methodology to determine the list of the Top 25 learning management system applications: reviews, integrations, mobile app availability, media presence, and security. We use a combination of GetApp’s product listing data and third-party sources to collect data for the ranking. For example, reviews are based on the number and average rating of user reviews on GetApp, while integrations are calculated using the number of integrations listed within a product’s profile on GetApp. Mobile app scores are determined based on the availability of iOS and Android apps and their related ratings in the Apple App Store and Google Play, while media scores are pulled from the number of Facebook likes and Twitter followers that a vendor has. For security, we asked vendors to fill in a 15-question security survey based on the Cloud Security Alliance’s Self Assessment Form, which we then score based on their responses. As a first assessment of cloud-based LMS software, I think it gives a good sense of the biggest players currently on the market and how they stack up to each other. It’s interesting that security is one of the criteria that GetApp scores. Why do you think it’s important for businesses to understand how secure their LMS might be? Security is always a point of contention when it comes to cloud-based applications, and LMS software is no exception. It’s not only important to ensure the safety of sensitive employee data that may be captured by an LMS solution, but also to protect a company’s learning materials and resources. Having a solution that offers different levels of encryption, different levels of access for different users, and options for data backup is essential. On top of that, using an LMS that’s transparent about the security measures it takes to protect your data should be an important consideration for business owners looking for a new piece of cloud software. There were some surprises on the list. There were a few vendors on the ranking that many might expect to see higher on the list, but a handful of those have a relatively high cost and steep learning curve. These provide practical barriers to entry for small and medium-sized businesses looking for a solution that fits their needs. It’s important to remember that this ranking is for small and medium businesses who may not be able to affordably scale some of the more well-known LMS solutions to their business. In terms of where the LMS marketplace is right now, are you seeing a growth in mobile apps? And if so, why do you think that is? Mobile uptake has been slower for LMS solutions than for other SaaS products, but it’s slowly starting to pick up momentum. The trend among most LMS vendors has been to offer web-based solutions that are mobile responsive and offer full functionality on a mobile device. In general, however, the contrast between mobile app versus mobile web usage is stark– a recent study found 88 percent of time spent on mobile devices is spent using apps, as opposed to only 12 percent on mobile web. In addition, mobile apps can take advantage of the devices themselves to provide novel functions not available in web-based LMS systems, like presence sensors that recognize whether someone is attending a class or not. Adopting a mobile-first strategy with native mobiles apps is quickly becoming a necessity. As employees become increasingly less location based, they’ll want access to their LMS solution from the comfort of their mobile device, rather than needing to be on a laptop or desktop. As LMSs become more popular, are you also seeing a rise in how robust the features are? What might be a good example of this? Generally speaking, LMSs continue to be standalone pieces of software, rather than being integrated as part of a full HR suite. With unique requirements, LMS software often includes a robust set of features that extend the usability and efficiency of the app. Two big trends are Extended Enterprise Training and xAPI. Extended enterprise refers to LMSs which are now set up with capabilities to train people outside of the company, including stakeholders, other vendors, and even consumers. xAPI, on the other hand (also known as Experience API or ‘Tin Can’), is an integration function that lets an LMS integrate with other software that can aid in the training process, like tracking and recording training videos being watched outside of the LMS itself. As LMSs become more complex, it will be key for a business to be able to accurately and objectively look at the learning management system options on the market and compare them side-by-side so that they can identify which solution caters best to their requirements. Each business is different, so there’s no such thing as a ‘one size fits all’ LMS out there. That’s why it’s so important to know your options before making a purchase. This infographic is just one way to help you come to that important decision. But what do you think about it? What learning management systems are you using? What features are shaping the decision in the LMS your organization uses? Share with us in the comments so we can see what conclusions you are coming to! I really wonder how useful such ratings are. Everyone who publishes such lists comes up with different answers. This list mixes business LMS’s with education LMS’s (Schoology and Edmodo) and includes one (Skillmeter) that isn’t an LMS at all. I’m a big fan of the elearning bros. but surprised to see you publishing this. So, if I read it right, GetApp define the top 25 LMS’s as those with the most Twitter followers (for the company not the LMS), most Facebook likes, user reviews on, well, GetApp, the number of integrations listed on, err, GetApp, the ratings on the App store for any public facing Apps, and a 15 question security questionnaire filled in by the company themselves. Personally, in the improbable event that I asked GetApp to help my business find the right LMS, I would be more interested in features, UX / usability, reliability, support, value for money, roadmap and yes security. I wouldn’t give a monkeys how many Twitter followers they had. This infographic is a triumph of style over substance and is best ignored. I like the infographic, very well presented, I’m just not convinced about the research…. it appears to be based mainly on a Google search. Their criteria include “reviews”, “media presence” (number of Facebook likes and Twitter followers) and Apps (based on a search for Apps in the public Apple store and their ratings). The other two criteria are Security based on a questionnaire, which presumably only went to those already on their short list? Did they provide any insight about UX, core features, or anything buyers see as relevant to a buying decision? It’s true that, as stated above in the blog itself, this infographic is just one way to help you come to an LMS buying decision. Honestly, I tend to think that user reviews and user following can at least give you an idea of how well known a product is and whether or not it has features, UX/usability, reliability, support, etc. that appeal to a wider audience, even if that is just assumed by those metrics. If you click through on the infographic itself, and then on each LMS company, you can even get a rundown of features, pricing and other great information. We feel that this is definitely a great start for people who are looking to find an LMS. With the number of LMS products on the market, it’s hard to even keep track of them all let alone get some sort of idea on ranking them. So I think this list definitely is more helpful than you give it credit for. Also, there is a wealth of LMSes out there (including the one that your and Mark’s parent company makes) that didn’t make the list. Lists that limit to a certain number are obviously going to have exclusions that still may be a great solution for other people or organizations. While we never claimed that this infographic or list would be completely comprehensive of every feature in every LMS on the market, we still think it’s a good beginning to what can often be a long road of research. Thanks very much for keeping up with our blog and adding your two cents. It’s always nice to hear from our readers! You make fair points about on line reviews Tom, and most of us use them of course when buying for example consumer electronics. But there is no reliable forum for reviews of LMSs and no particular incentive for corporates (or education establishments I imagine) to post to them if there was. I’m not concerned about whether SkillsServe is on the GetApp list or not – although I confess that if we had been on the list and near the top we would have been tempted to tweet that :). But I am concerned about bad research being dressed up in pretty infographics. To take one example, Oracle appear in 9th place above. They have no reviews on GetApp, but the company does have 399,000 Twitter followers – not the LMS of course but the huge global corporation. That accounts for about half their marks in this list, while telling you zilch about their LMS. I suspect I’m fighting a losing battle. To give Oracle the benefit of the doubt here, social media followings may say nothing of the LMS specifically, but it does tell you of the company behind it. As a similar example, I’ve known quite a few people who pick up Adobe Captivate because of the brand knowing very little of how it compares to other authoring tools. (I also happen to think that it’s a good product, but that’s another conversation.) Is that a bad thing? Not if they’re able to accomplish what it is they want to with the product and it gives them confidence in the brand behind it. Companies who have a well established brand will mean something to people searching for a product; it’s the reason why companies spend a lot of time on brand image and brand management. It holds a lot of value, and definitely can give weight to someone who is making a purchasing decision. But I totally get your point. Like Don mentioned above, one on the list isn’t really even an LMS (it’s more of a testing platform). Even still, not every Top 25 list is going to be perfect (that’s what often makes them controversial), especially when it’s answering a question like “What is the best LMS to use?” It’s a question that’s going to have to be based on different criteria for different individuals and is therefore steeped in a lot of opinions on what things matter most. We liked the way this information was presented, both in the infographic and on the site, and thought it would be a great way to help answer a question we so often get. So, while the data may be skewed in this instance toward specific results (as with many infographics, like you point out), it’s just important to know how that information was gathered and whether or not it’s meaningful to you as an individual. For some, brand popularity may mean absolutely nothing. For others, having a brand you can trust backing a product you’re purchasing is a huge bonus. It’s the same kind of thing that makes some people love using a free solution or what makes people find whatever works no matter the price. It doesn’t make the research or data behind this infographic bad; it just makes the criteria (and therefore the importance of the rankings) different for each individual. Not everyone sees eye to eye on the same features and information. And that’s totally fine! 🙂 In fact, that just means that people are taking the time to be discerning with their decision. That’s good! There’s definitely a reason I think choosing an LMS can be a long road with a lot of ways to both start and get to the end. I first want to thank the eLearning Brothers for the write up on the Top 25 LMS in this quarter’s GetRank. And in answer to Peter, unfortunately not every top list is 100% correct nor will please everyone but it does give end users a place to start looking for a software solution to suit their needs. We will take your concerns into account for next quarter’s GetRank. And once again thanks to the eLearning Brothers for the write up. I initially missed the note that “this ranking is for small and medium businesses who may not be able to affordably scale some of the more well-known LMS solutions to their business”. That makes sense given the size and scope of what we’ve seen with Saba, CSOD, and other big players. Thanks! And when I changed the search criteria to “Large Enterprise” I didn’t see Saba or CSOD listed. I appreciate the tool. It is handy; however, I often find tools as such slightly deceiving because they blend two very uniquely different types of LMS applications. For example, I see Blackboard, Schoology, and Canvas as virtual classroom LMS applications that typically require a record management system to integrate for handling registrations, etc., such as Banner. Whereas, applications such as e-Logic, Saba, Cornerstone, etc., tend to support on-the-job/at-the-moment professional development deployment and are self-contained. It all connects back to research in selecting the best LMS based on the need. I have found that many organizations end up with both. They use a virtual classroom environment to handle long-term training that is facilitated and a professional development deployment system for the shorter self-paced training. If you get the right combination, the later acts as the records management system that integrates with the virtual classroom system (SSO, API, etc.). It is funny how so many of these LMS’s do not appear on Gartner’s Magic Quadrant. Hard to believe a company like Gartner doesn’t have these vendors on their radar if they are that good. By my (albeit brief) look, Gartner’s Magic Quadrant doesn’t have anything really on Learning Management Systems at all. I would say that if Gartner hasn’t even looked into the topic very deeply, it shouldn’t be surprising that most of these listed technologies (or even related technologies that aren’t listed here) aren’t showing up on their radar. Do they have any recommendations on the topic? I’d be very interested to read through more on the matter. Interesting infographic and write-up. Thanks! Although I work as a consultant to of the top-ranking LMS companies (#3 Expertus), I also wonder about the evaluation and methodology. With hundreds of learning platforms on the market, I understand why organizations like GetApp want to help buyers narrow their choices. But if the filters aren’t clear (or are based on one-size-fits-all criteria), it could create even more confusion. There are several independent LMS analysts who study and segment the market, and they are more transparent about why/how they develop specific evaluation criteria. For example, Craig Weiss publishes an annual LMS report at E-Learning 24/7, and John Leh publishes freely available vendor reviews and annual awards for LMS platforms in various categories at TalentedLearning.com. IMHO Canvas is the best education LMS and the best corporate LMS is Taleo. Thanks for your input Phil! Brother Thomas is right. Gartner hasn’t done a magic quadrant for the LMS market in 5 years. They are only doing talent suites these days. Even though my company ExpertusONE is highly ranked on this quadrant, I’m not too impressed in their criteria. There are so many other sites like GetApp who have a better way of measuring the quality of LMSs. I’ve tried a few LMS from this list, Blackboard and Canvas. They are almost perfect. But for needs of my company it was mandatory to have LMS installed locally, on our servers, since the personal data of employees and resources for employees training and certification are sensitive and has to be highly secured, on local servers without internet access, which in case of cloud based LMS isn’t the case. Also, my legal advisors advised me not to choose cloud-based LMS because by some laws it is restricted to store personal data of employees or clients online. So at the end, I’ve invested money in best possible solution at that time, and that was Youtestme Classroom 2020. The investment paid me off in less than one year.